Each Carrier Contains: 8 Kit Kat, 8 Reese's Peanut Butter Cups, 8 Hershey's Milk Chocolate with Almonds, and 6 Twizzlers. Each Carrier Contains: 8 Kit Kats, 8 Reese's Peanut Butter Cups, 8 Hershey's Milk Chocolate with Almonds, 6 Twizzlers. 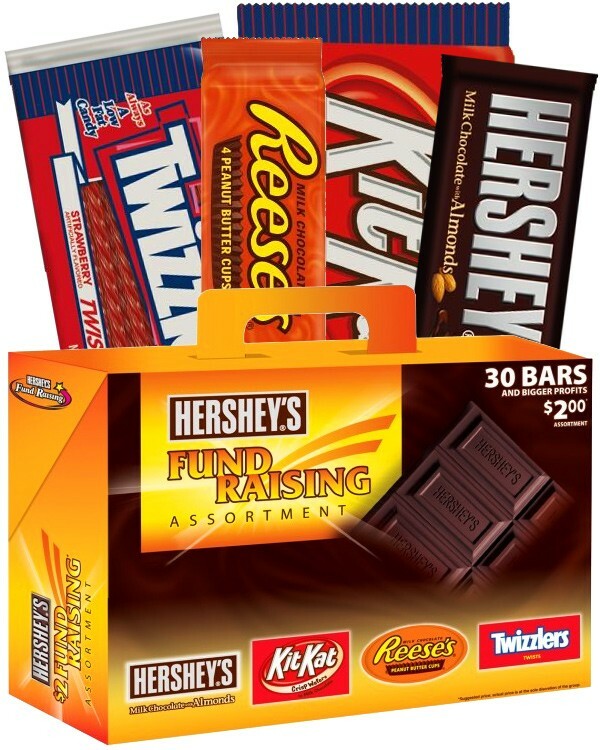 4 carriers per case for a total of 120 candy bars per case of $2.00 Hershey Fundraising Assortment. Candy bar size range from 1.85oz to 5oz. Your supporters will love the sweetly familiar taste of Hershey's chocolate, and will love the super-size format even more! Priced at only $2, your supporters now get to eat more of what they enjoy, while your group makes twice the profit with every bar sold! Up to 47% Profit: Your profit varies from 27% profit to 47% profit depending on how many cases of candy bars you order. Minimum Order: Just 1 case to start your candy bar fundraiser. Free & Quick Shipping: Shipping is completely free, no matter how many cases you order. Expect delivery within 7 days. How Does The $2 Hershey Fundraising Assortment Fundraiser Work? 1. Determine how many candy bars you feel each of your group members can sell, so you know how many cases to order. Each case contains 4 carriers of 30 candy bars each, for a total of 120 bars per case. The minimum order is 1 cases and shipping is free (additional shipping may apply if temperature is above 80F). 6. Your participants will sell each of these Hershey Fundraising Assortment candy bars for $2 each, and collect their money on the spot. Wish the Hershey Bars did not have the almonds in them. They would have all sold much easier without. We raised money for our New helmets and bat bags for the team. This was the first time our daycare used Just Fundraising and we are definitely happy we did. Our kids sold the 2$ Hershey Bars and we sold everything in less than 2 weeks, the delivery was quick and easy and being able to work with a fundraising assistant made the whole process a breeze.